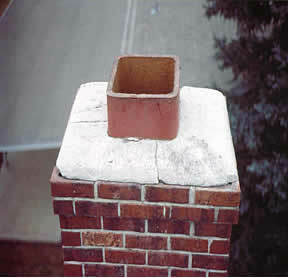 One of the largest “holes” in any home or business is the chimney flue. Left uncapped, this hole will attract many invaders such as raccoons, squirrels, bats, chimney swifts, wood ducks and even snakes! The rising heat from a fire or the heat pulled out of a home allows birds to warm themselves and they may tend to flock around the opening. This can result in a bird falling or flying into the flue. Uncapped chimney openings also allow birds to fall down into the fireplace. When there is no chimney cap on the flue, there is an opening in your home all the way to the damper. If the dampers open, then the animal can get into the fireplace. If glass doors are in place, they will keep a bird in, but if it is a squirrel or raccoon that has invaded your fireplace, they can push against the glass doors and open them. Now the animal will come inside the home and wreak havoc! Having an angry, confused, wild animal roaming around in your home can be quite an unpleasant experience. Another area of concern is that flue gas vents will sometimes be used by birds for nesting purposes. The nesting material can plug up the gas vent allowing carbon monoxide gas to build up to deadly levels inside the home or business. These gas vents also must be inspected and protected the same as any chimney flue. The Wildlife Control Professionals at A All Animal Control can help with all your chimney cap and flue vent needs. Call us today for a complete evaluation and avoid any upleasant surprises in your home. Your complete source for custom and standard size chimney & vent caps designed and installed.